Rajya Sabha Chairman Hamid Ansari has appointed Supreme Court Judge, Justice Ranjan Gogoi as the head of the panel investigating the allegations of sexual harassment levied against Madhya Pradesh High Court Judge, Justice S.K. Gangele. The reconstitution of the panel had to be undertaken due to retirement of Justice Vikramjit Sen. The notification issued by the Rajya Sabha Secretariat on Wednesday partly modifies its earlier notification, issued in April 2015, under Section 3(2) of the Judges Inquiry Act, 1968. The notification had constituted the panel, also comprising of Justice Manjula Chellur, Chief Justice of Calcutta High Court; and Senior Advocate K.K. Venugopal. Last month, the Rajya Sabha Chairman had sought a definite opinion from the Law Ministry on whether retired Supreme Court Judge Vikramjit Sen can continue to head the panel constituted to investigate sexual harassment charges levied against Justice Gangele of Madhya Pradesh High Court. You may read the LiveLaw article here. While opining that a retired Judge could not continue to head the panel, the Law Ministry had referred to certain provisions under the Judges (Inquiry) Act, 1968, which refer only to sitting Judges with regard to constituted committees. However, Advocate General Mukul Rohatgi had opined that Justice Sen could continue heading the panel, even after he has retired. You may read the LiveLaw article, here. 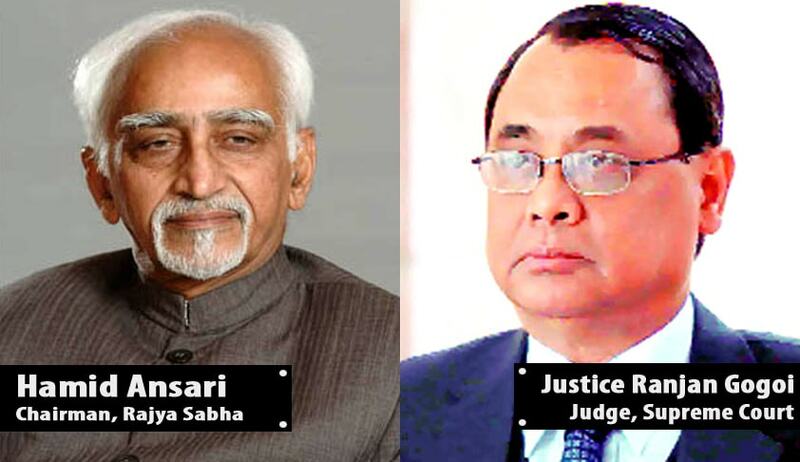 In April last year, a three member judicial committee had been set up by Vice President Hamid Ansari, in order to initiate impeachment proceedings against Madhya Pradesh High Court Judge S.K. Gangele, on charges of sexual harassment against him by a former Additional District and Sessions Judge. You may read the LiveLaw article, here. The HC Judge had however denied all allegations and has reportedly offered to face any probe by any agency including an investigating agency, ready to “face any penalty, even the death penalty”. A few female lawyers had demanded an impeachment proceeding against the Judge. They have reportedly moved a resolution in the Supreme Court Bar Association demanding an enquiry into the matter. Commenting on the impeachment motion, senior Supreme Court lawyer Indira Jaising, advocate for the former judge, had said, “It is a welcome step. I am very hopeful that justice will finally be done to the lady who had to resign, while the HC Judge, who stands accused of such a serious offence, continues in office.” CJI Lodha had hence urged the formation of a panel comprising of senior Judges in order to investigate the allegations of sexual harassment. Read the Live Law story here. The woman Judge had however contended that until the MP High Court Judge continues to assume his post, the witnesses would not be able to depose in a free and fair manner. She further alleges that one of the two members in the panel had once transferred her and that might lead to prejudice in the investigation. You may read the Live Law story here. Consequently, in December, 2014 the Supreme Court had quashed the inquiry initiated by MP High Court and had directed the Chief Justice of the High Court to divest the accused Judge of the administrative and supervisory control vested in him, in order to ensure that the investigative process in fair and just. You may read the judgment here. However, last year, the three-Judge committee had found that that there was “insufficient” material to establish the charges. In its report dated July 2, 2015, the committee had also concluded that the HC Judge was “ambivalent and evasive about facts which are within his knowledge”. You may read the LiveLaw article here.